“In the past, even the future was better!” At least that is what Bavarian comedian Karl Valentin said. So obviously MtG: Commander, or better Elder Dragon Highlander (EDH), should have been a better format in the good old days, too. You know, those times when EDH was just this quirky format those crazy Judges where playing after the real tournament had ended. In a time before they even invented the Internet for netdecking. A time where you were on your own. Out in the wild. A time where you did not have to worry about the Erayo, Soratami Ascendant-Prison-Lock-Deck. A more moderate, slower, more peaceful time. A time when Urza and Mishra where still fighting arms deep in clockwork-creatures (like Clockwork Horse) to find out who was boss. An age when terms like Voltron-Decks, Douchbaggery or Group-Hug had not been coined. The Casual Inquisition was probably already there, but still wearing diapers. Long before they even started burning players on the stake (not the stack). It was an innocent time with endless possibilities and limitless potential. Now it is time to look back at these days and reminisce on the long way EDH has come to finally evolve into MtG:Commander. So today we will have a Blast from the Past, when we return to the very foundation of EDH. To the good old days, when they just had released the Ice Age-Block. You know, the times when Brainstorm was probably worse than Portent. Back then it was common place to use Duals in your EDH because they where crazy cheap. Also power pieces like Timetwister or the all available uncommon Force of Will where still easy to come by. Just like how before EDH came around, some people thought it was ludicrous that Black Lotus was 20 bucks. Current Head Designer Mark Rosewater including, as he once stated in an interview. 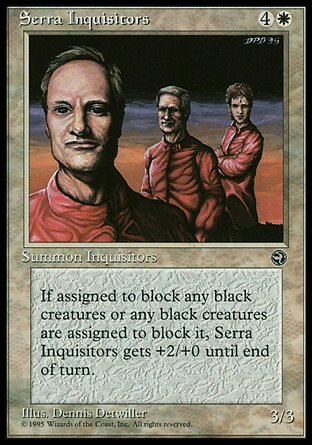 What has the future brought for Magic: the Gathering since then, you might ask? – and the simple answer would be: A lot! The game has since changed in unmeasurable amounts. It changed not only in form, but also in function. Starting with more streamlined card texts, continuing with more streamlined rules. Finally even a new card frame, something I have always been disgusted with. Not because I did not like the new design, in its futuristic form with curved lines and smooth appearance. But rather I dislike the fact, that from now on, till end of the game, there will be two designs in Magic: the Gathering. Something that always looks strange in my eyes, maybe even stupid, when holding a hand of cards with different designs. In remembrance of the good old times, where we still could look out for a better, brighter future, I built an old school EDH deck. I hope you enjoy it. A good old school control deck, without all the degenerate stuff from the future we live in. So I pledge you today, to remember the good old times – as one day, all we have will be our sweet memories of the game we love. We are having a good run here with the game, but I am sure there will not be a new set coming out the year I move to the retirement home. History has been kind to Magic. So let us raise our glasses of fine (at least 12 year old) Whiskey to Richard and Mark, and all those other gamers who made the game survive this long. Karl Valentin also once said: “Today is the good old times of tomorrow.” So let us see what the future brings for the Format we now call MtG: Commander. ‘Till next time, keep it casual my dear readers, even when tapping cards with the new design.